“If I touch him on the chin, he’s going down,” said Vargas. “That’s a guarantee. I’m sure it’s going to be a hostile territory, but I’ll impose my will on him. He’s an old man. He’s been hurt before and he’s been stopped many times. Ryan Kelly defends the Midlands Area Super-Welterweight title he won in May via stoppage at Villa park against unbeaten Dordon man Kelcie Ball, Stourbridge banger Sam Eggington appears on the bill with Super-Bantamweight star Gamal Yafai, while Geordie Lightweight ace Lewis Ritson keeps busy ahead of his return to the Metro Radio Arena on October 13. Preston Super-Welterweight Scott Fitzgerald takes on Ludlow’s Craig Morris over ten, Leeds Super-Bantamweight Qais Ashfaq faces Southampton’s Ricky Little, with action elsewhere from Northampton Middleweight Keiron Conway, Belfast Lightweight Sean McComb, Bolton Super-Bantamweight Osman Aslam, Gloucester Super-Lightweight Akeem Ennis Brown and Birmingham Cruiserweight Shakan Pitters. Khan is back in action following his blistering return to the ring in April in Liverpool, destroying Phil Lo Greco in just 39 seconds after nearly two years out of action. The former unified Super-Lightweight ruler is setting his sights on Welterweight World honours this year and steps up that pursuit in Birmingham when he meets Canadian based Colombian Vargas, the 29 year old ranked number 10 in the WBA and having shared the ring with current IBF king Errol Spence and Khan’s old foe Danny Garcia. “One of my aims this year was to be as active as possible so I’m very happy to be back in the ring again so soon against Samuel Vargas,” said Khan. “Vargas is a tough and well-schooled fighter who has shared the ring with some top welterweights including Danny Garcia and Errol Spence Jr.
“I have to get past Vargas before looking at the biggest challenges going forward. I’m not going to be taking Vargas lightly because I know he will be coming with everything on September 8. “I am excited to step in the ring with Amir Khan on September 8,” said Vargas. “I am very pleased that my promoter Lee Baxter and Eddie Hearn from Matchroom Boxing could come to an arrangement fairly easily and make this fight happen. Khan’s clash with Vargas will top a packed card in the second city, as Jason Welborn defends his British Middleweight title in a rematch with Tommy Langford, whom he snatched the title from in May via split decision in Walsall. Ryan Kelly defends the Midlands Area Super-Welterweight title he won in May via stoppage at Villa park against unbeaten Dordon man Kelcie Ball, Stourbridge banger Sam Eggington and Super-Bantamweight star Gamal Yafai appear on the bill after boxing this coming Saturday, with more title fights and stars to be added. Matchroom Boxing UK are delighted to announce Former Middleweight World Champion Darren Barker alongside Chris Lloyd will present a series of new fight week build up events to be streamed live on social media and for international broadcast partners. 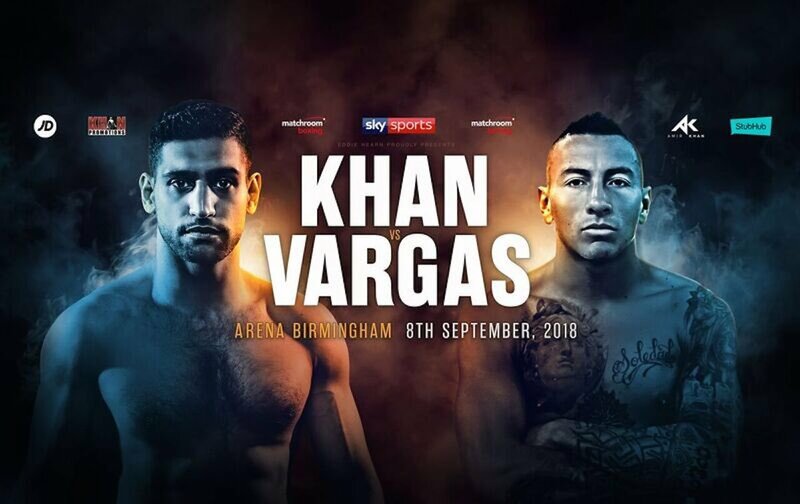 Kicking off the new boxing season in Birmingham this Thursday – ‘Last word’ will stream either side of the Amir Khan vs Samuel Vargas press conference with a host of fighters speaking exclusively, concluding their media duties for the week. On a Friday of fight week – ‘Off the scales’ focuses on all the action at the official weigh-in. Continuing the countdown to fight night, the show will offer a final preview and give fans analysis and opinion from the camps, media and promoter. ‘Before the bell’ is the fight day show which airs live and exclusive on location in the arena as the clock ticks down to doors opening and the opening bell sounding. “We’re delighted to welcome Darren back in to the Matchroom fold and bring Chris onboard to help launch an improved streaming offering to fans across our social media channels during the fight week build up,” said Scott Hammerton, Matchroom Boxing’s Head of Social Media. “Live content is being digested more and more and this allows fans to experience additional behind the scenes coverage and exclusivity, for each of our shows moving forward. Former IBF World Middleweight Champion Darren Barker links back up with Matchroom five years on from his crowning moment and subsequent retirement. “I’m very proud to be working back with Matchroom, the promotional outfit that guided me to a World Title, “ said Barker. Barker is joined by Chris Lloyd, who has been working with Matchroom behind the scenes over the past couple of years and brings various experience in producing, directing and commentary to the table. “I’m hugely excited to be working on this new venture with Matchroom Boxing. The way we are viewing sport globally is changing,” said Lloyd.